Need a portable, light-weight target stand? Here’s a clever, minimalist alternative to large wood-framed or PVC pipe target stands. Those will work, but they take up lots of space in ones vehicle and, unless you build a very solid base, they tend to rock back and forth, or even blow over in high winds. 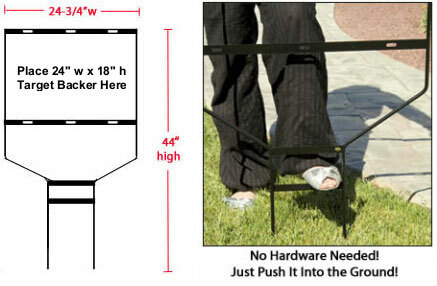 For under $20.00 you can get a metal sign frame that can be staked directly in the ground. These sign frames, commonly used for real estate signs, are secure in high winds, and they are just about ideal if you need a simple target for zeroing during a varmint hunt. With most of these frames you can secure a cardboard target backer with zip ties or threaded fasteners. With some frames you just slide the cardboard backer into slots, so no fasteners are required. The most common “Empire-style” sign frame has a rectangular section at the top with two pointed ends about 10″ apart at the bottom. Put your foot on the crossbar to drive the frame into the ground. An angle-iron, Empire-style frame (no fasteners required) is offered by the fastrealestatesigns.com for $19.99. Shown at right is a plastic sign frame that requires no fasteners. Simply cut your cardboard target backer to 24″ (w) x 18″ (h) and slide it in from the top. Then stick the frame into the ground using the foot-slot near the bottom. These fiberglass-reinforced plastic sign frames are light yet surprisingly strong. They cost just $11.95 from Yardsigns.org. There is also an open top model ($10.95), and a larger, rectangular version ($15.95) with the legs placed 19″ apart. If you shoot where the ground is very hard or rocky, these stake-in-the-ground frames may not work so well. They need to be seated firmly in the soil. But if you shoot in an area with soft soil or grassy turf, these frames can be a handy solution. Simple, light-weight and easy to set-up, they make a nice “field expedient” target holder. 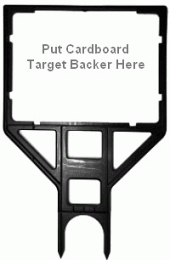 Share the post "Commercial Sign Stands Make Great Target Holders"
Hey, this tip’s for real. Just saw a guy using one of these at the range today. Sign frames are great target holders. Be sure you have a pair of gloves though. If you hit the frame the edges are very sharp. If the ground is dry, it is difficult to put those into the ground. I own one.